Medical or Health tourism has become a common form of vacationing, and covers a wide variety of medical treatments. It mixes leisure, excitement, fun and relaxation, combined with healthcare which is highly cost effective. Other highly attractive benefits include the opportunity for patients to avoid long waiting lists and with the savings they make, get a holiday included in the package. 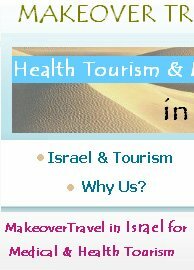 Medical tourism in Israel has grown dramatically, as it offers world class healthcare services at low costs. Becoming a medical tourist in Israel, allows you to make huge savings and see one of the worlds most beautiful and diverse countries at the same time. Medical tourists are an expanding group and one of the leaders in the field is Israel. Tourists from all over the world benefit from the vast range of medical treatments and high quality research provided by Israel's leading hospital. The Israel Health care industry is undergoing phenomenal expansion. The combination of high quality services and affordable cost facilities is attracting thousands of international patients every year. This is hardly surprising considering the cost of advanced surgeries in Israel is from 10 to 15 times lower than in the USA or Europe. Added to this a growing number of hospitals have formed alliances with the US and European hospitals in an effort to improve overall care and stand on par with the best hospitals in the world. 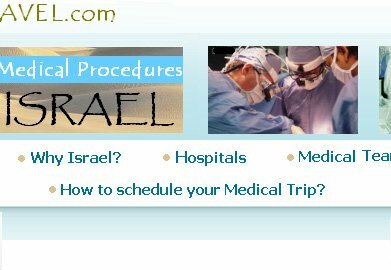 When compared to other popular medical tourism countries, Israel has the advantage of hospital facilities, experienced doctors and cost. Acknowledging the Center's high level of medical expertise and cutting-edge capabilities, Newsweek Magazine has cited the Medical Centers and hospitals in Israel as 'One of the World's Top 3 Medical Destinations for Tourists', for people seeking excellent specialized medical care, and 'a leader in its field'. 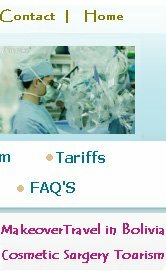 While cost is a consideration; it is the quality of heart surgery that is the most important factor for most patients. The success rates in Israel's top hospitals for heart surgery are an average of 99.3% which is more than most of the leading cardiac centers in the world. Israel has one of the world's best medical systems, and each one of our Medical Center plays an integral part in Israel's advanced national healthcare system. The country has impressive health statistics including one of the world's lowest infant mortality rates (3 per 1,000 live births) and a long life expectancy (84.9 years for women, 81.9 years for men). These figures reflect the Israeli government and public's obligation towards healthcare - supporting advanced health services, top-quality medical research, a modern network of hospitals, and a remarkably high physician/citizen ratio. Israel's healthcare system ensures that every citizen - from birth to old age - is entitled to superb medical care. Israel's health expenditure is amongst the highest of any developed nation. The Ministry of Health is responsible for overseeing and supervising all health services, implementing nationwide standards, issuing medical licenses, and supporting medical research. There is virtually no area of medicine to which Israeli devices have not made significant contributions. Cardiology, genetics, neurology and ophthalmology are but a few of the medical sciences benefiting from advanced Israeli technology. From neonatology to gerontology to the latest in telemedicine, Israeli scientists, universities and companies are working to benefit the entire health system, from physician, to patient, to medical administrators and insurers. Israeli medical and biotechnological firsts include state-of-the-art surgical lasers; fully computerized no-radiation diagnostic instrumentation for breast cancer; an intelligent medical sensor that can be used to track and direct instruments to an exact three-dimensional location in the heart or other organs via a real-time virtual image; the fully flexible waveguide fiber for endoscopic surgery; unique computerized monitoring systems for critical care patients; pain-relieving transcutaneous devices; a revolutionary autoclave design to combat AIDS and other infectious diseases; and many more. Three of the biggest commercial plays were scored in medical devices and technologies: ESC and Laser Technologies merged into one company, valued at one billion $US. Medinols cardiac stent was purchased by agreement with Boston Scientific Corp.; and Biosense Ltd. was purchased by Johnson and Johnson, each in deals closing at about 400 million $US. Each of Israel universities and research institutes has established its own research authority. These authorities assist professors in finding, applying for and administering grants and funding for their research. Each has generated a commercial limb that also initiates investor searches, helps private launches, assists commercial exploitation of research by drafting and filing licensing agreements, actively guides technology transfer and encourages patenting of new discoveries before they are submitted to peer-reviewed journals, to prevent the current worry publish and perish. Thus these research and development enterprises give the universities a chance to profit from and reinvest the fruits of their research by working through subsidiary companies while at the same time increasing the potential for new development in industry. For instance, medicine and medical equipment are the dominant start-up sectors at most Israeli universities and at the same time provide the technological expertise for most of these industries. - Ben Gurion University of the Negevs Ben Gurion Negev Technologies and Applications Ltd., for example, offers support in both medicine and bioengineering. It has pioneered the Neuromedical Electrical Stimulation Systems Ltd. (NESS), a glove-like device that can stimulate movements in a paralyzed hand or arm. Another commercial innovation is the Savyon Diagnostics rapid diagnostics kit for fungal infections. - Bar-Ilan Universitys Bar-Ilan Research and Development Co. Ltd. spawned Medis El Cell Scan an advanced electro-optical blood cell sorting device to diagnose and detect early stages of cancer. - Hadasit Medical Research Services and Development, an enterprise of the Hadassah Medical Organization Ltd., in Jerusalem, has facilitated innumerable licensing or joint ventures in cancer therapies, osteoporosis, diabetes, cardiovascular disorders, orthopedics, diagnostics, medical devices and laser technologies. - In 1966, The Technion Israel Institute of Technologys Technion Research and Development Foundation, founded Elbit Ltd., as a start-up company, considered the original progenitor of the medical device industry in Israel. Today, it is a giant healthcare and diagnostics conglomerate with sales of 970 million $US annually. - Tel-Aviv University Ramot, with its Rad-Ramot high-tech incubator in Tel Hashomer Hospital, has generated several start-up companies. The now well-established Organics Diagnostics Ltd., produces ultra-high sensitive and fast diagnostic kits, and recently merged with American giant, Selfcare Corp. Another younger success is Combact which has a unique technology for rapid bacterial analysis. - Established in 1959, Yeda Research and Development Ltd., of The Weizmann Institute of Science, pioneered the concept of pure research benefiting from its own applications. It has spawned thousands of successful medical technology initiatives. - Yissum Research Development Company Ltd., of The Hebrew University of Jerusalem was established in 1964. In 1997, it signed 130 contracts, half of them with companies abroad. One of its products is a tiny, biodegradable chip developed by the Faculty of Dental Medicine, which treats gum disease by slowly releasing chlorhexidine. It was acquired by the local conglomerate Israel Chemicals and is now valued at 140 million $US. To avoid missing out on rapid developments across disciplines, and to keep from becoming too competitive with each other, the autonomous university research authorities formed an alliance, FURAD (Forum of University Research Authority Directors), that pools and strengthens their technological and administrative resources. FURAD helps to assure that the Israeli academic community responds to rapidly-evolving changes in the research funding environment, both in Israel and abroad, and stays in touch with the networks of regional and global partnerships (with the European Union, for example) and interdisciplinary research projects. Jointly, the Research Authorities maintain and update a comprehensive national database of Israeli academic research and development, lobby government ministries for funding, expand global partnerships, and contribute to and implement national scientific research policy. The government is also actively involved in the medical technological sector. Nearly half of the approximately 200 nascent technologies under development in government supported incubators are medical technologies, not to mention those in biotechnology and software. Magnet, a program of the Chief Scientist of the Ministry of Industry and Trade, has a five-year budget of over 200 million $US to support carefully targeted generic technologies or pre-competitive concepts, such as electro-optics or biomedical diagnostics, by coordinating groups of academics and businesses. Healthcare and medical technology especially electronics has been identified as the most promising growth sector by the Healthcare Department of the Israel Export Institute. Partner to making that possible is the business and marketing effort of the 24 American-Israel Chambers of Commerce, first created in 1953, and Associated in 1993, representing over 3,000 American business and professional members, based largely in Minnesota and in the Chicago and Boston areas. Growth of medical technology depends not only on insights and ideas, but on proof through rigorous testing for safety and efficacy. Speed, not haste, is the motto when weighing public health needs versus public health protection. Testing of devices is controlled by the medical device assessment department in the Ministry of Health, which over the years, has adapted a process which corresponds with that of the U.S. Food and Drug Administration (USFDA). This harmonization allows laboratory, animal and clinical (those involving human beings) studies conducted in Israel to qualify as proof for approval, as if they were conducted in the U.S. The result is a streamlined approval process and a shortcut to marketing Israeli medical technology in the U.S., making healthcare delivery more efficient and up-to-date. The USFDA recently modified its procedures to make the approval process more efficient by actively guiding inventors and researchers in formulating their testing protocols to meet USFDA licensing demands; thus, the focus was shifted from a test of the trials to a test of the products themselves. In contrast, Israeli government regulations require only those medical devices which release radiation, contain components derived from animal sources, or are coronary stents, to have ministry approval for marketing in Israel. Expanded legislation to empower the Ministry of Health to examine and/or approve all medical devices is currently being formulated and is expected to be in effect by the turn of the century. Israel's system of ethical standards, established to meet international criteria following the Helsinki agreements, is exacting. Proposals to initiate clinical trials, for instance, must be reviewed by a system of ethics committees, which convene in every hospital and medical institute. Considerations are based on ethics, moral and religious implications and social impact, as well as on health and safety grounds. Examples of the complex questions the committees might ask could include: Could a new contraceptive device be used to abort as well as prevent pregnancy? or How would technology to determine brain death which often occurs before the heart stops beating affect declaration of the moment of death and thus, decisions about when organ donations may be made? Technological growth is geometric, not linear, with one industrys previous inventions spawning new developments in another. This trend comes into play, for example, with medical technologies which have profited from previous developments in the electronic defense industries. Opgal Medical Systems, a subsidiary of El-Op Electro-Optics Industries Ltd. in Nes Ziona, specializes in thermal imaging, remote sensing, lasers, and displays. Opgal Medicals IVA-2000 Thermal Imaging System for cardiac surgery is based on thermal coronary angiography (TCA), a technology originally developed for military uses like night vision and heat-seeking surveillance. 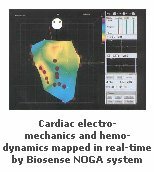 The improved accuracy in angiographic imaging, and in image storage improves decision-making in the surgical operating theater and benefits the entire health system, from physician (user), to patient (consumer), to medical administrators and insurers, and back to the patient (consumer). Medical insurance costs have been reduced because the number of re-do operations is significantly reduced: the system documents the procedure, reducing malpractice insurance; operating theaters are freed; and the reduced recovery time from minimally invasive procedures cuts bypass costs by half. Once a device is created, its use during applications invariably spins off other developments. A new thermal sensor, invented at the Jerusalem College of Technology, for example, makes thermal imaging readings more precise during an angiogram. The sensor will be incorporated in the next generation of the OpGal line of products. Applications in ocular surgery, neurosurgery, peripheral vascular surgery, cancer detection, and dialysis control with this device are under discussion in Europe, the U.S. and Israel. Economic forecasts indicate a bright future for the biotechnology and biomedical sectors in Israel. The medical technology and devices sectors stand out with the highest growth of any sector during the late 1990s. No fewer than 60% of the 1,500 start-up companies in Israel are in the medical and life sciences arena, with no indication of a slowdown well into the next millennium, according to a survey conducted by the Science and Technology Forecasting Center at Tel Aviv University. By the year 2008, forecasters say, Israeli biomedical and biotechnology industries will have sales of 3.9 billion $US, almost ten times the sales in 1997; and investment in this sector will grow to 930 million $US in the year 2008, and to 8 billion $US in 2010. According to Ernst & Young, investment analysts, the very best prospects for the industrys growth, are in the medical devices, bio-electronics, diagnostics and smart drugs sectors. Pure biotechnology, on the other hand, requires greater investment and a longer development time more than twice the two-to-four-year average estimated development time for medical devices. The international accounting firm, Kesselman & Kesselman PricewaterhouseCoopers showed in their Money Tree Survey that the average medical devices sector venture capital investment increased in 2001 by 72% to 9.2 million $US from 1.5 million $US in 1997, with most medical device-based companies located in Haifa and northern Israel. In spite of the need to overcome seemingly insurmountable odds, such as distance, language, cultural differences, and fluctuations in the continuing peace process, Israel has become a prime site for international venture capital and technology-seeking funds, especially since the beginning of the 1990s. Since 1992, more than 80 venture capital funds are investing in medical technologies, raising nearly 7.5 billion $US, about half of which was invested within six years. Medica Investments of Medica Venture Partners, like the private Medmax, is a unique fully-dedicated healthcare fund. Because of the high expertise and long-term view, Medica takes a pro-active brokering interest in the business and the science in all of the 19 biotech and medical device investments in its 75 million $US portfolio. Interest in Israels medical technology by giant multinationals like Bristol Myers-Squibb, General Electric, GEMS (General Electric Medical Systems), Johnson & Johnson and Siemens has grown increasingly competitive as Israels reputation for high-tech innovation and ingenuity spreads. More industry is being developed locally, for example ELGEMS, a joint venture formed in 1997 with Elscint, for the design and manufacture of medical imaging products. During 1999-2005, Israels healthcare exports spiraled upwards from 7,9 billion $US to 8 billion $US. The electro-medical equipment sub-sector made the largest contribution to the industrys growth during this time, accounting for a full 69% of total exports, followed by pharmaceuticals and chemicals; biotechnology and diagnostics; and medical supplies. , the U.S.-Israel Binational Industrial Research and Development Foundation, matches Israeli high-tech companies with strategic partners in the U.S. Instrumental in establishing the commercially successful Israeli electronics, communications, and software sectors, BIRDF recently prioritized new biomedical technologies and the links among the biosciences and electronics and computer sciences. And BIRDF is not alone. Recognizing this new and emerging realm of endeavor, in April 1998, a joint seminar of BIRDF and , the U.S.-Israel Binational Science Foundation, focused on three spheres that combine the expertise of cell physiology, electronics and biomedicine: bio-chips and gene-chips; bio-sensors and neuro-sensors; and nanotechnology. * Tuttnauer Co. Ltd. in Jerusalem is a world leader in steam and gas autoclaves of all sizes for sterilizing medical instruments for clinics, hospitals and laboratories. * Perio biodegradable chip with slow release chlorhexidine to treat gum disease from the Hadassah Faculty of Dental Medicine, sold to Israel Chemicals. * CAPTEK gold, platinum, palladium metal composite for aesthetic, high strength dental crowns and bridges that reduce plaque by 10% on natural teeth. * ASI APPLIED SPECTRAL IMAGING Cytogenetics and pathology have been revolutionized by SKYTM (Spectral karyotyping), SkyVision, and the SpectraCube to sort chromosomes, cells or tissues in colors reflecting genetic abnormalities. * Trans-Scan T-Scan devices which significantly improve mammography diagnostic accuracy with no additional radiation. * SophisView Technology Ltd. (SVT) MACOM 4000 and MAPP 4000 digitized mammography which enhance sub-millimeter details. * MedEye Medical Imaging Ltd. AngioVision for retinal diagnosis, digital angiographic acquisition and viewing systems. * Talia Technology Retina Thickness Analyzer (RTA), a combined electro-optical laser and conventional optical instrument for the non-invasive measurement of ocular pathologies. Its Laser Slit has been marketed since 1996. 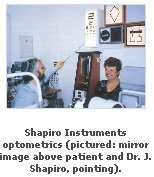 * Shapiro Instruments (Israel), Subsidiary of Shapiro-Evans Perceptions Ltd. (UK) Innovative optometric examinations using simple technology, but sophisticated philosophy. * Delve Medical Ltd. an electronic stethoscope with phonocardiograph instrumentation to receive and digitally process body sounds, filter out interfering noises, and graphically present the sounds on a display screen. * Diagnostic Sleep Laboratory Ltd. diagnostic equipment for sleep recordings (respiration, ECG, movements). * First Care (Jerusalem) bandage that enables self-application to wounds; can also block arterial flow and increase distal hemostatic pressure. * Mennen Medical Ltd. Cathlab patient monitoring equipment for critical care. * Wais Med Bone Injection Gun (B.I.G. ), treats emergency patients with drugs and other fluids by intraosseous infusion, directly into the bone marrow. * CBF Medical Ciliary Beat Frequency monitor attaches to a standard endoscope, to optically measure the frequency waves of ciliary cells as new diagnostic for mucociliary function in respiratory disease and tubal infertility. * Myriad Ultrasound Systems SoundScan Compact and SoundScan 2000 bone quantitative sonometers which detect subtle changes in bone quality, as in osteoporosis and other bone diseases. * Sunlight Ultrasonics Omnisense the only sonometer providing multiple sites skeletal bone density assessment. * LMS or CHAI (life in Hebrew) the USFDA-approved Sure-Closure Skin-Stretching system, replacing costly skin grafts or flaps to close large wounds and avoid disfiguring scars; newer applications focus on polymer technology, a medium for graft storage and a first-ever wound gel for dermal ulcers and chronic wounds. * SPM RECOVERY sealed chamber to apply ozone/oxygen mixture and bacterial medium to infectious wounds, post-surgical wounds, trophic ulcers, decubitus, and burns. * SIL-K silicone sheeting from Kibbutz Degania, which has USFDA approval, eases intense pain after scar-tissue removal operations. * Oridion (originally Spegas) pioneered infra-red measurement of carbon dioxide exhaled by patients at all points of care. u Elrad Analytical Systems systems which monitor gases in patients during medical treatment. * Optomedic Medical Technologies the Kaplan PenduLaser, a carbon dioxide surgical laser system. * NurtureLife the Patir incubator in Jerusalem a device for checking the amount of milk an infant drinks during breast-feeding. * Hisense Ltd. 200 $US monitor called Babysense, sends out an alarm if a baby stops breathing while asleep, as happens in SIDS (sudden infant death syndrome). * SPO Medical Equipment Ltd. Long Life, an early warning monitor, which senses lowered breathing and pulse levels and could prevent SIDS. * Medco Electronic Systems Ltd. Femo, a non-invasive fetal ECG and fetal heart rate monitoring system with true beat to beat variability, which prevents unnecessary C-section deliveries. * Cybro Medical an optical and non-invasive fetal monitor based on pulse oximetry complementary to the ECG to reduce unnecessary C-section deliveries. * Vital Medical the Tissue Vitality Analyzer (TVA), expected to save lives and millions of dollars by detecting failed organs before implantation. * Titan Electronics a compact, pocket-sized, battery-powered Transcutanous Electronic Nerve Stimulation (TENS) stimulator to relieve menstrual pain. 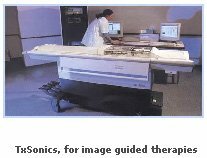 * InSight Therapeutics and GEMS new joint venture TxSonics produce state-of-the-art devices for image guided therapies. * UltraGuide 1000 new add-on device for ultrasound-assisted interventional procedures. * Real-time Radiography Readout (R3) Ltd. a joint venture of YISSUM (the Research Development Company of The Hebrew University of Jerusalem) and T.T.I. (Target Technologies Israel) Ltd.
* X-Medica new concepts in filmless digital X-ray, for the next generation of medical imaging. * NESS (miracle in Hebrew) a USFDA-approved glove-like device that aids therapy in restoring function to paralyzed hands and arms. * Card Guard with a Hewlett-Packard UK alliance provides software-hardware systems for Cardiology/Portable ECG, Pulmonology/SpiroPhone Transtelephonic Spirometer, and Ob/Gyn/Portable Fetal-Maternal Monitoring Device. * Imexco General produces CardioScope a pocket cardiological diagnostic ECG monitor, with storage, printer, and transmission capabilities. * TzamalCare innovative remote controlled systems, Infu-Tech and Infu-Net diffused infrared wireless transmitters and readers to monitor and control infusion therapy from a remote station. * MTRE Advanced Technology ALLON 2000 returns and maintains normothermia of core body temperature into trauma management, during surgery and post-op. * Medisim Up-Grade gives quick, accurate, digital readout of body temperature. * Influence a device to treat urinary incontinence. * Medispec Ltd. and Direx devices for treating kidney stones, gallstones and various prostate disorders. * Opgal Medical Systems, a division of Opgal Optronics Industries Ltd. in Karmiel the IVA-2000 Thermal Imaging System for real-time thermal images of blood flow through exposed coronary arteries, without ingesting toxic contrast materials or exposure to radiation. * OrSense Ltd., a start-up Hemosense, an infrared-based bloodless blood test of hemoglobin and hematocrit. * Vascular Technologies Ltd. award-winning device attaches to a standard catheter to indicate correct insertion of an infusion needle into a vein.